For every RPG I acquire, I will "pay the tax" to ensure I at least read it by posting how it came to my attention, why I bought it, and giving first impressions. If you find it useful, great! But the purpose is to keep me from tossing cool things into a "to be read" pile and then forgetting about them. 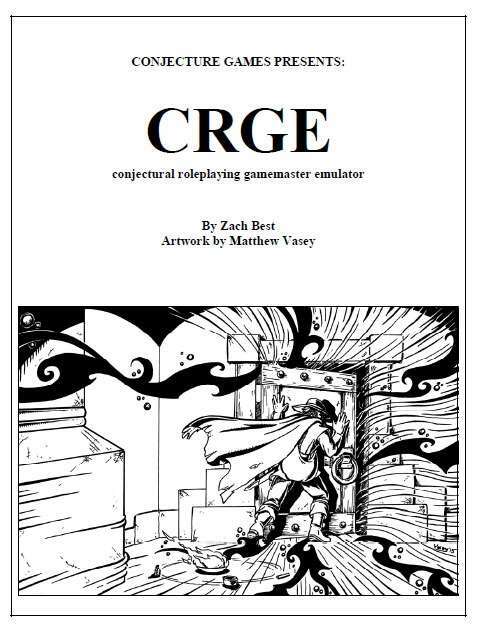 CRGE: Conjectural Roleplaying Gamemaster Emulator. PWYW at https://www.rpgnow.com/product/145426/CRGE-Conjectural-Roleplaying-GM-Emulator. 1. How did this get my attention? I put up a survey in the Google+ Lone Wolfe Roleplaying community about what people would want in a solo-play zine. One of the questions I asked was about favorite tools and several people listed CRGE. I had no idea what it was, so I hopped online to look it up. 2. Why did I pull the trigger? I am in the research phase for systems and formats for solo play. I know what works for me, but it can be an awkward/confusing exercise for a lot of people and I want to come up with a really good format, so ... gotta look into the tools that are working for practiced solo players. This 32 page doc has a pretty simple layout and competent art. Frankly, the look/feel neither inspires me nor turns me off. It's a workmanlike document. That's fine. It's more than satisfactory for a PWYW product. So what is CRGE? The name is pretty accurate. It's a supplement designed to help people play an RPG with this emulator in place of a gamemaster, and it relies heavily on questions (conjecture). It is not written specifically for solo play, though I can see why soloists have gravitated towards it. One cool addition to the Loom is a surge score that gets bigger when you roll a simple No or Yes. The next time you roll you add the surge number if you are in the Yes half of the chart (>50) and subtract it if it's in the No half (≤ 50). This has the effect of keeping you from having a long string of simple Yes and No results (which are the most common). Eventually you will push into one of the more nuanced results, and that resets the surge die. There is a LOT of other useful advice and examples in the book about Narrative Momentum, asking questions, framing scenes, tracking thematic threads, etc. One half of my brain thinks its a bit overwrought – too many terms, too much to think about. The other half of my brain appreciates the attempt to talk about some of the artistry that goes into moving narrative forward. If I were going to talk about one other thing, it would probably be this idea of Narrative Momentum, "chipping" vs. "cutting questions," and Stage of the Scene. All of these are interrelated and they are essentially a way of bringing attention to how the pacing and specificity of questions you ask should shift as scenes move from exploration to closure. When you are staging a scene "To Knowledge" you will ask more "chipping" kinds of questions and more questions in general. When you move "To Conflict" or "To Endings," your questions become more "cutting." There tend to be fewer of them because they shove the fiction forward more dramatically. Ultimately, CRGE has too many terms/too much "weight" for me, but all of the ideas are good and I think the doc is worth reading and thinking about. My guess is that most people take what they want and ignore the rest. It's what I'll probably do. I've already been thinking about incorporating a surge die into FU that leads to the CRGE unexpectedly table! CRGE is well worth a few bucks even if you never use it at the table. It may help you add an element or two to your approach to games, as a player or GM. If nothing else, it makes you think about the elements that drive scenes.